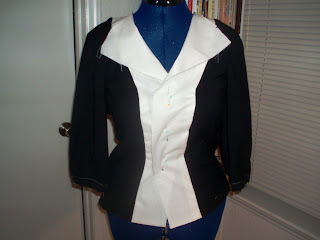 So far, I have completed the muslin lining of the BWOF 02-2009-102 jacket. I traced out a 38, which is for a 34-1/2″ bust. This is a challenging pattern in that some of the seams didn’t match up as well as they could have. This jacket has princess seams, and I had some trouble with getting the side front/front facing and side back/back to match. To solve this, I will stay-stitch on the front facing and back piece 5/8″ (my seams are 3/4″) and clip to the stitching to get the seam smooth on the curve. 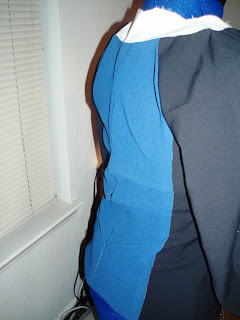 I already started on my outer fabric portion, and this seemed to work well over the initial easing on the side pieces. Another thing that gave me trouble was the facing. I should have sewed the back facing to the front facings and then to the rest of the lining. Instead, I got it all mixed up by initially sewing the front facing to the side front, and then adding the sleeves and sewing the back facing on top of it all. Trust me when I say I had a confusing mess going on, and there was a lot of seam ripping and resewing to get it right. Anyway, this is what the muslin lining looks like now. I tried it on, and so far so good. My only concern is that the hip is a little small on me, so the front facing doesn’t completely overlap. But looking at the model photo, her jacket doesn’t completely over lap at the bottom either, so I think I’m good. But maybe I’ll widen the pattern at the hips a bit. Here’s a view of the back. It’s puckering due to the fact that the seam is not completely sewn. I’m trying the “bagging a lining” technique, and you have to leave an opening to turn the whole jacket right side out at the end. Again, looking at the model photo, I don’t think the jacket is supposed to lay completely smooth, but it’s to be worn with a belt for some cinching at the waist. Well, well see once I get the outer portion together. Great progress. I’ve still to do a fba to my traced pattern. I hope to start with this sometime next week. Thanks for the info on the seams, I’ll double check. Wao, you have made lots of progress, I am sure you will do a fantastic job. Can’t wait to see the final project. @ Opal, I agree! I’m not messing up my silk! LOL. Its always good to do a muslin first so you can work out all the issues before you cut into your good fabric…. Can’t wait to see the final project….. Thanks, Jacqui! I pretty much just want a replica of what’s in the magazine. Sometimes that’s all you want. LOL. Great progress. The final fabric choice is TDF!